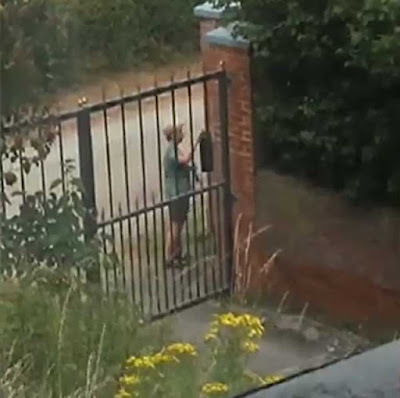 Pressure is mounting on a village councillor who works with the police to step down after she was caught on camera stealing her neighbour’s mail. Joy Harbottle was filmed picking out the delivery from an external letterbox on the street where she lives in Kings Clipstone, Nottinghamshire, before hiding it under her top and walking away. The footage initially shows the postman dropping off a large letter before Councillor Harbottle is spotted approaching the property. The police confirmed they had been called and had spoken to her, but no further action has been taken. Neighbour and victim, Michael Umphray, said he was shocked by what he had recorded on his mobile phone. The 65-year-old said several vital letters had gone missing in the previous weeks so he decided to lie in wait. He said: “I was just shocked by what I saw, it speaks for itself. She came along 10 minutes after the postman had been. “We have never been that neighbourly, and she was never rude to us but I don’t know why she would do this. We never approached her, we knew straight away that it was a police matter, although we didn’t want to press charges because we have to live next door to her.” However, locals are now calling for her to step down from Kings Clipstone Village Council where she also serves on the safer neighbourhood committee, liaising with police officers about local crime issues. Villager Keith Laver said: “She was there when I went to the last council meeting, anybody else would have resigned with the shame.